Senior Resident and posts in different fields. Eligible candidates can apply using the official website of ILBS @ http://www.ilbs.in through online. ILBS Recruitment selection is based on written test/ Interview. Last date to reach online applications is 15/06/2017. 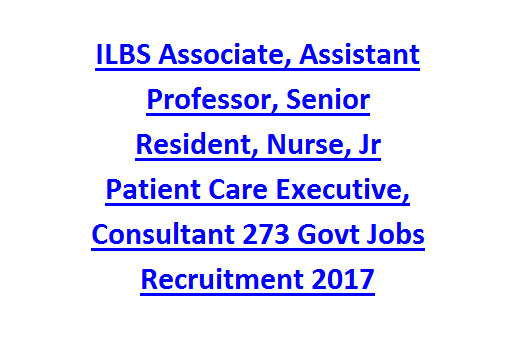 ILBS Recruitment 2017-Available vacancies, Age details, Pay Bond, Examination fee are given below. Last date to submit online applications: 15-06-2017. Candidates are advised to see the notification for post wise qualification details. Candidates will be shortlisted for the ILBS recruitment vacancies based on their performance in Interview/ Written test by Selection Committee. Application fee for General/ OBC candidates is Rs. 500/-. For other candidates (SC/ST) is Rs.100/-. Interested candidates may go through the ILBS official website @http://www.ilbs.in through online before 15-06-2017. 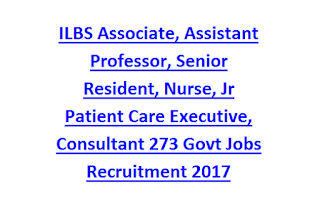 Apply online for the Senior Resident, Consultant, Nurse Jobs in ILBS Recruitment 2017.